New Years Eve party table can be decorated with winter inspired crafts and Christmas ornaments. 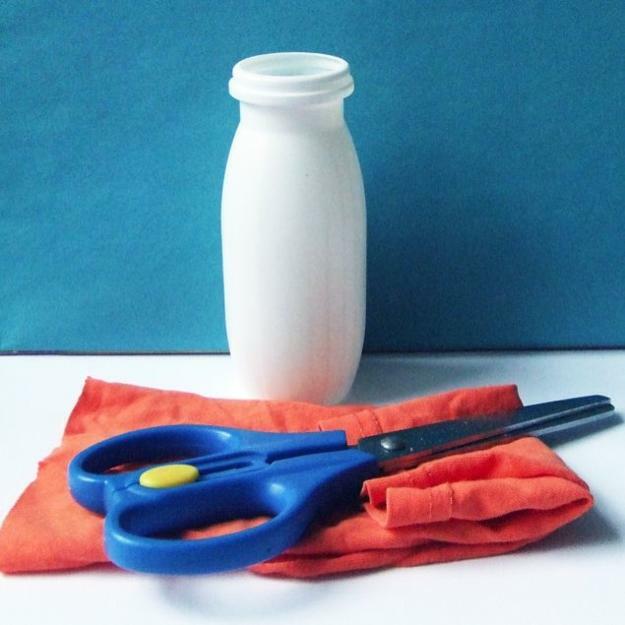 This post shows how to reuse and recycle empty plastic bottles and make decorations for New Years Eve party table to delight kids and older guests. Cheap and easy to make, these decorations are wonderful recycled crafts, which can be used with creative installations to enhance the spirit of the celebration. Simple recycling ideas and creative crafts help make decorations that surprise your guests, enrich your New Years Eve party decor by adding unique winter inspired items and turn your party table into an interesting and original display. Recycling plastic bottles for the party decorations is a fabulous idea that allow to save money and enjoy Green holiday in style. Kids and adults around the world celebrate the end of the old year and the beginning of the New Year. Winter decorating ideas, combined with winter inspired crafts are an easy way to create festive and relaxing atmosphere. Small, intimate gatherings and bright New Years Eve party decor that include simple recycled crafts, like the plastic bottle Snowman, and colorful Christmas ornaments can turn this special night each year into an unforgettable event. Snow man decorations, recycling plastic bottles can be created in different sizes, shapes and colors. These holiday decorations can be combined with Christmas lights, paper snowflakes and cotton snowballs. The choices for your New Years Eve party are endless. 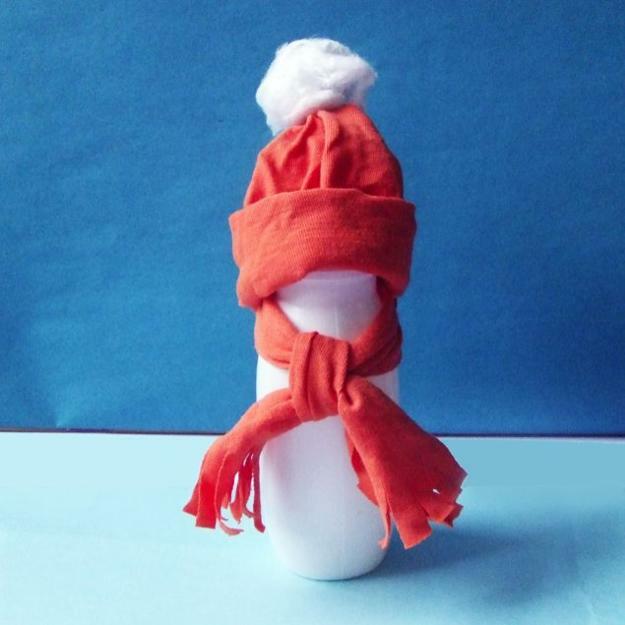 To make these cute snowmen you need empty plastic bottles, small fabric pieces or knitted fabric, scissors, clay and yarn or cotton balls. 1. Knit or make a scarf of fabric with fringes on its ends, make a yarn or cotton pompom and two mittens. 2.Make a hat from the same fabric or fabric in different color. 3. 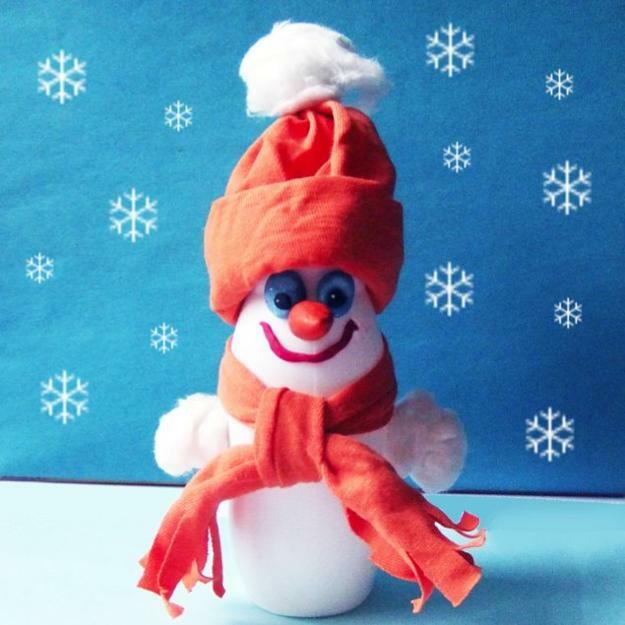 Use white clay to sculpt the snowman’s face, glue mittens and a hat to your snowman. You can use a large snowman decoration as your New Years Eve party table centerpiece. You can make a few smaller snowmen for individual centerpieces or window decoration also. Celebrating the New Years Eve is not a modern tradition. It started as the Babylonians festivities to mark the first New Moon and welcome the spring. The modern calendar has changed over the centuries, and now each New Years Eve party is the celebration of the new beginning and hope for happiness. New Years Eve is symbolic, it is the end of the old year with the birth of a new year. Each culture has a different way of celebrating this rebirth, and winter decorating ideas, – snowmen, snowballs, snowflakes and bright fireworks are the parts of New Years Eve celebration in North European, East European and North American countries.